It was a more innocent time, before texting and “Carlos Danger.” To woo fair ladies, young Filipino men would sing harana love songs outside their homes, waking up most of the household in the process. Sadly, the practice fell out of favor, but a young guitarist and three old masters recreate the romantic sounds and spirit of old school serenading in Benito Bautista’s Harana (trailer here), which screens during this year’s Asian American International Film Festival. Returning for his father’s funeral after a long American sojourn, Florante Aguilar suddenly found himself powerfully drawn to traditional forms of Filipino music, especially the harana. Do not use the word Latin to describe harana—it is a pure product of the Philippines. Nonetheless, it might sound somewhat akin to the bossa or other Lartin-influenced styles to uncouth ears. Harana performance might not be quite as rare these days as the documentary suggests. After all, Filipino jazz singer Charmaine Clamor recorded a lovely set of harana ballads just a few years ago. Still, like a harana Alan Lomax, Aguilar starts off on a quest for real deal, old school haranistas. Eventually, he found them in Felipe Alonzo, Celestino Aniel, and Romeo Bergunio. What begins as a series of informal jams, blossoms Buena Vista Social Club style into more formal performances, a proper tour, a recording session, and this very same documentary. It was an opportunity none of three gentlemen expected—that came just in time. Viewers will eventually pick-up a sense time might be short for at least one haranista, but Bautista bends over backwards to avoid exploiting that fact for dramatic impact. As a result, Harana has a rather slack narrative structure, basically covering the “let’s get a band together” and “let’s put on a show” bases. Still, the music is obviously the thing for Harana and the ballads they sing are wonderfully lyrical and evocative. There is something especially touching about the sight and sound of the three men of advanced years signing songs of young love and eternal fidelity. By the way, Aguilar certainly holds up his end. He has loads of technique, but more importantly he has the perfect sensitivity to accompany the haranistas. 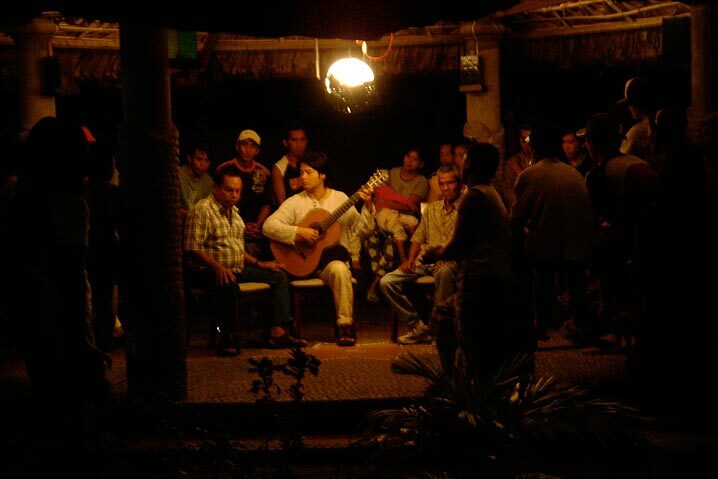 Haranas are meant to be sung at night, so all the resulting moonlit performances only enhance the film’s nostalgic vibe. It is all quite a pleasant trip, gently propelled by the delicate but catchy rhythms of the harana. 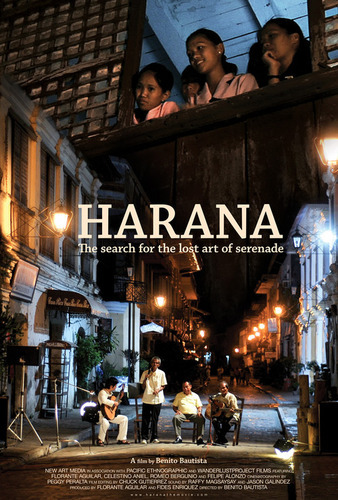 Recommended for those who appreciate a good love song, Harana screens this coming Wednesday (7/31) at the Anthology Film Archives, as part of the 2013 AAIFF in New York.